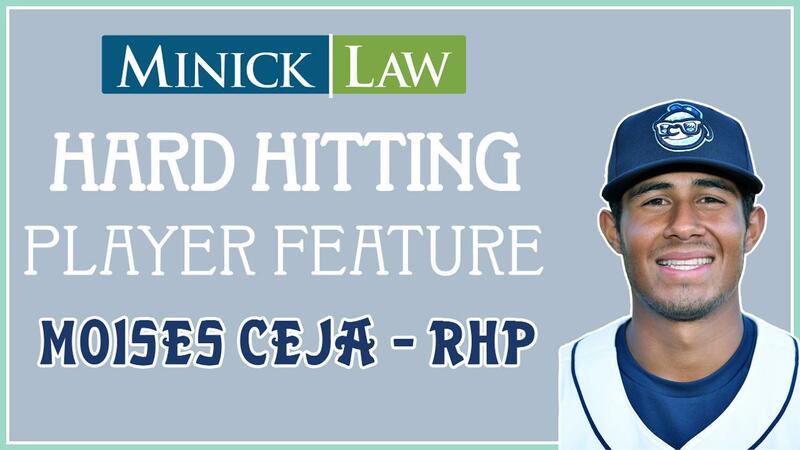 In part three of our three-part series of the Minick Law Hard Hitting Player Feature, I sat down with Asheville Tourists relief pitcher Moises "Mo" Ceja. Mo answered in depth questions about his time at UCLA, his family, and his time with the Tourists. Mo, we'll start with a softball. What are the different pitches you feature in your arsenal? I throw a fastball, a change-up, and a slider. I try to be fastball dominant but definitely use a mix of all three. Relying on my fastball is one thing but I have to use my other pitches to keep the hitters from timing me up. At what point in your life did you realize that you had the ability to throw harder than a majority of people in this world? It was after my sophomore year of High School, I just came back the next year and was throwing my fastball a lot harder than before. Is there a moment or a certain game that sticks out to you where you thought to yourself, hey I can do this at a professional level? I think the biggest factor that helped me decide as to whether I could pitch professionally or not was being accepted to UCLA. Obviously, it is a very good baseball program and when I signed there I knew it was not something to be taken lightly. Once that happened, I knew that if I put the time and effort into it, I could make pitching my profession. You pitched at UCLA against some of the top talent in the country, but it wasn't always easy. Share a little bit about your path to college. During high school, I wasn't exactly considered a top talent that was being watched by a ton of people. Actually, I almost snuck through the cracks. But I just happened to be at the right place at the right time with the right eyes looking at me and at that point I knew that I had to take every game seriously. Once I made my way to UCLA, my first two years weren't exactly the best years. I didn't have very many innings and I definitely faced a lot of trials but I knew that if I wanted to really make a career out of pitching I needed to work at it. So, I spent a lot of time working out and working on my throwing program. After my sophomore year there I really started to notice the hard work paying off. While you were at UCLA, what were some of the difficulties you had to face away from the field? Well, being away from home is never easy. Fortunately, I have an amazing family that has always been there to support me. Even being hundreds of miles away I feel their love and I feel their presence every day. I know that I'm not only doing this for myself, but for them as well. This season has been an interesting journey so far. It began for you in extended spring training, then you came to Asheville for a bit, then back to extended spring training before heading to Grand Junction. Now you're back with the Tourists and pitching with a vengeance. What have you learned throughout this season? I guess one of the biggest things that I have learned is that I just need to keep it simple. Wherever I am in the country it is still the same game. I'm going to go in with the same approach mentally and physically. Moving around as much as I did I think is a blessing in disguise. I learned a lot about the process and learned a lot of things about myself; how to really set my routine in stone and how to approach the game. It was a learning process and another thing I am very grateful for. Moises Ceja made 9 appearances with Asheville from the middle of April to the end of May. His ERA was 5.52. Since then, Mo appeared in 13 games with Grand Junction before earning his way back to Asheville at the end of July. Mo's ERA in Grand Junction was 1.64. Mo has posted a 1.69 ERA and limited opponents to a .206 batting average with Asheville since earning his second opportunity in the South Atlantic League.